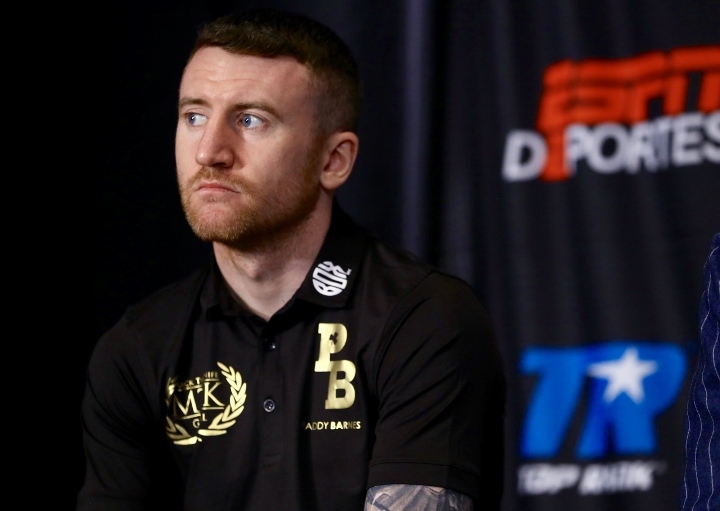 Seven months removed from his first career loss, Paddy Barnes hoped to catch the luck of the Irish on the undercard of a St. Patrick’s Day card at Madison Square Garden’s Hulu Theatre in New York City. The two-time Bronze medalist and three-time Olympian from Ireland instead found himself in an all-out war turned disastrous in a split decision loss to Oscar Mojica. All three judges had the bout scored 58-56, two for Mojica and one for Barnes in the ESPN-televised opener. Not even an Irishman dubbed ‘The Leprechaun’ could sustain any sort of luck on the festive Sunday, suffering a broken nose barely a minute into the contest. A counter left hook from Mojica turned Barnes’ nose into a gusher, although the former title challenger did his best to fight through the blood and adversity. Disaster nearly struck in round two, a déjà vu moment for Barnes who—seven months after suffering a body shot knockout to then-flyweight titlist Cristofer Rosales—saw a similar blow once again send him to the canvas. Mojica apparently never got the memo that he was brought in as an opponent, taking the fight to the 20/1 favorite and scoring what was thought to be a knockdown with a left hook downstairs. Barnes did his best to steady himself before being forced to the canvas. The sequence, however, was ruled a slip as it was deemed that a glove push to the shoulder—and not the preceding body shot—caused the fall. Barnes did his best to rally back, trading on the inside with Mojica down the stretch of a certain round of the year contender. The ruling did not at all sit well with the corner of Texas’ Mojica, who believed the fight was being stolen from them. Mojica (11-5-1, 1KO) kept his foot on the gas, clearly upset-minded and with the heavily favored Barnes looking worse for the wear. Barnes rallied back hard in round four, a rare frame where Mojica in fact backed off from his two-fisted attack. The strategy paid off for the Texas journeyman, who put together a brilliant 5th round which sealed the fight for him on two of the three scorecards. A valiant finish by Barnes in the 6th and final round—where he attacked Mojica’s body and let his hands go for virtually the entire three-minute sequence. It wasn’t enough to close the gap on the scorecards—and perhaps not enough to even remain a pro fighter. “Honestly, I’m seriously thinking about retirement,” Barnes (5-2, 1KO) admitted to ESPN’s Bernardo Osuna afterward, an interview reminiscent of his dejected feel after an opening round loss in the 2016 Rio Olympics following back-to-back Bronze medal runs in 2008 and 2012. “I got hit in round one. I couldn’t see due to the pain through my (broken) nose. Mojica was 3-5-1 in his last nine starts, but returns home with by far the biggest win of his career as he improves to 12-5-1 (1KO). The bout served as the opening leg of an ESPN-televised tripleheader, headlined by Barnes’ countryman and Olympic teammate, unbeaten featherweight contender Michael Conlan who faces Ruben Garcia Hernandez in a 10-round main event. This looks like the end for Paddy.